NEVILLE TWP., Pa. — The Sacred Heart Pioneers were the better team once again on Saturday night at Colonials Arena, using a mix of opportunistic scoring, timely saves and tilted ice in an important 3-1 victory. 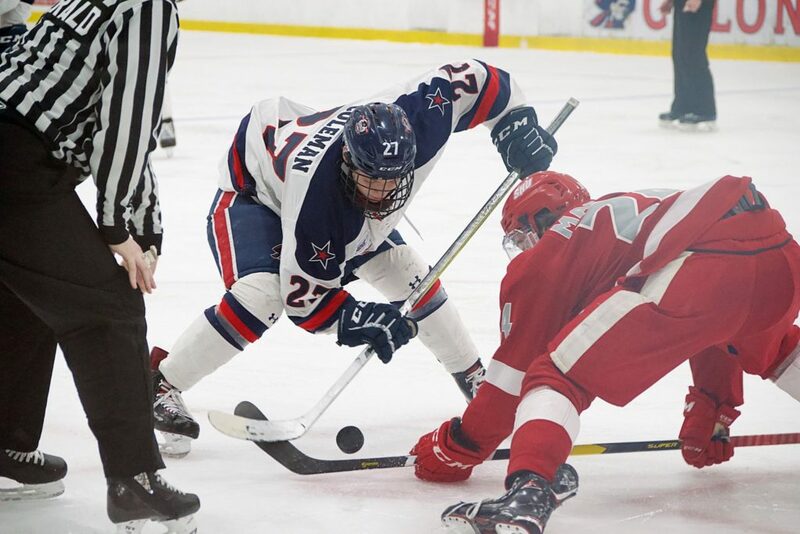 The win put the Pioneers ahead of Robert Morris in the standings- and in the battle for home ice in the upcoming Atlantic Hockey playoffs- as the Colonial slump continued for yet another weekend. The Colonials were out shot by a 34-18 margin for the game and weren’t able to convert on a number of prime scoring chances. The frustrations for Robert Morris appeared in various forms, including an awkwardly deflected early goal against, a loose puck that turned into instant offense at the end of a power play and so on throughout 60 minutes of hockey. Jordan Kaplan was the beneficiary of a gift at 13:38 of the first period as a shot deflected off Colonials forward Alex Tonge’s skate and behind goaltender Francis Marotte to put the Pioneers out front. Despite out-shooting the opposition by a sizable advantage, Sacred Heart was unable to gain separation until the 10:03 mark of the second period. Austin Magera finished a tic-tac-toe style three-on-two break in the Colonials end for his seventh goal of the season. The two goals stood up thanks to a strong defensive effort and efficient performance from goaltender Josh Benson, who stopped 17-of-18 shots in his eighth victory of the season. Despite the 34 shot effort from the Pioneers, the Colonials found themselves in a winnable situation late in the third period thanks to a number of key saves from Francis Marotte. The junior net minder turned away 31 shots on the evening, including several prime chances during five Pioneer power plays. Marotte and the penalty kill kept the Colonials in the game, and junior forward Daniel Mantento put his team on the board at 16:05 of the third period with his sixth goal of the season. Robert Morris was unable to draw closer with Marotte pulled in and Magera added an empty net tally with two seconds remaining for his second goal of the night and eighth on the season. The Colonials find themselves with a weekend off before taking to the road to battle the Holy Cross Crusaders.